Thank you, all those who attended the conference in Lincoln New Zealand and who filled in the feedback form. A brief summary of the points made, together with areas for reflection and ideas for topics for future events can be found here: NZ feedback report. These materials are now online. Click here and scroll to the bottom for keynote transcripts and PowerPoint presentations. A selection of photos can be found here. Many thanks to our speakers, organisers, photographer and everyone who came and shared so much of their life and ministry. Looking forward to the next one in 2022! It is our tradition to issue a statement after each quadrennial conference. Here is the statement from the New Zealand conference. The gifts he gave … to equip the saints for the work of ministry, for building up the body of Christ. Tēnā koutou, tēnā koutou, tēnā rā tātou katoa – Greetings to all. We greet and honour Almighty God who made the heavens and the earth and knitted us together in our mothers’ wombs. We greet and honour the forebears of the land where we gathered and the forebears of all of our peoples around the world, entrusting them to the love of our saviour Jesus Christ. We greet all rural churches and followers of Christ from near and far. Tēnā koutou. We have this message to share with our Christian family throughout the world, rural communities, and leaders of national and international church organisations. We are followers of Jesus from all over the world with a call to minister in communities in rural areas. Ninety-four people from India, Sri Lanka, Romania, Switzerland, France, England, Scotland, Canada, USA, Korea, Fiji, Tahiti, Australia, and New Zealand gathered at Lincoln University–Whare Wānaka o Aoraki to explore the theme Growing Together. For us all, local and visitors, it has been an unforgettable experience, meeting and talking with rural Christians from other parts of the world, truly an opportunity for practical and spiritual enrichment. In worship, music, presentations, workshops, and times of fellowship, we immersed ourselves in the faith that unites us, looking at the contexts we inhabit through the lens of biblical narrative. What is different between us, culturally and denominationally, is not a barrier but rather a source of inspiration and growth. We came together to encourage each other and learn from one another, in our work of serving God and our communities so that they can flourish. Sharing deeply, in a great variety of accents and perspectives, inputs reflected both our diversity and our commonality as rural people. Our common goal is for our churches and communities to live the vision God dreams for the world. Part of our purpose is to bring reconciliation in our communities. In New Zealand this includes reconciliation between first peoples and more recent settlers. It can be a painful process seeking healing for the way colonisation and consumerism have abused soil and rivers and peoples and continue to do so. In other places there is need for reconciliation between communities for different reasons but in each case it involves the privileges of community being exploited by some at the cost of others. In all of our home places we seek now to graft ancient wisdom onto contemporary knowledge so all peoples and rural communities may flourish as we serve one another and our creator God. During the week we grew together as a learning community. We considered what IS, what COULD BE, and what WILL BE in our regions, sharing ideas, experiences, and inspiration that we pray will be transformational for us, our areas and our nations. We were inspired by the strong convictions expressed that God is active in our rural church communities and is leading us into new pathways. God is the starting point and goal for all we are and do. Focussing on our activity to change the world may lead us astray. We call for more prayer in order to focus on God’s vision and so become the light of the world Jesus commissions us to be. Rural churches need visionaries who, in partnership with God and others, challenge the status quo and take risks to find innovative ways to communicate God’s love and meet rural challenges in a fast changing world. Rural churches seek to build up all the people of God to encourage ministry by the whole body of Christ. We seek support for collaborative ministries and remind those in positions of influence in our churches that the call to ministry belongs to the whole people of God. True ecumenism means sharing common space without losing one’s own identity. As the body of Christ the church is always a “uniting” church, building relationships of respect and collaboration. Our world is bigger than our own backyard. Many regions face challenges that risk lives and we are aware of the impact of climate change, especially on Pacific nations and low lying continental regions, of persecution on minority faiths in many parts of the world, and of consumerism on traditional livelihoods. Awareness calls us to change our behaviours towards the planet, other nations, and others in our own context. We need/urge our denominational churches to listen to our voices from the rural areas and positively support our mission and ministry. 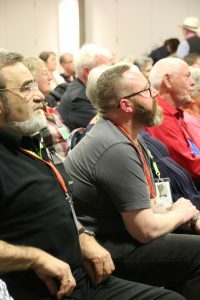 We offer to churches the resources gathered within the IRCA network – on-line material, models of ministry, and personnel with expertise and strong ecumenical and international connections. The Association reaffirms its solidarity with rural communities which are vulnerable to global economic and political influences and to man-made and natural disasters. Rural areas need a voice. We in IRCA will continue to take on this God-honouring role to be intentional voice with the voiceless, and be active in raising the profile within our churches of the challenges of rural ministry. The IRCA 6th quadrennial conference has made a great start today. We began with the traditional Maori welcome. As leader of the visitors, Jerry gave a speech following a particular sequence of greetings and explanation, backed up by a ‘Waiata’ sung by all the visitors. This was very positively received. Here is the text, which sets the scene for the event. We greet and honour Almighty God who made the heavens and the earth and knitted us together in our mothers’ wombs. We greet and honour the beloved forebears of the people of this place and the many people I stand on behalf of today, entrusting them to the love of our saviour Jesus Christ. On behalf of all the visitors we want to thank the people of this beautiful land for the warmth of your welcome and the hard work so many have put in to enable us to be here. We visitors are followers of Jesus from all over the world with a particular call to serve communities in rural areas. Our growing global fellowship gathers every four years in different parts of the world. We come together to encourage and inspire each other; and to learn from one another; in order to be better equipped to serve our own communities and enable them to flourish. Part of our purpose is to bring reconciliation in our communities, especially between those who have cared for the land for generations and more recent settlers. We accept that this can be a painful process as we incomers seek forgiveness, for the way we have abused soil and rivers and peoples. We seek now to graft ancient wisdom onto our own knowledge so all peoples and rural communities may flourish as we serve each other and our creator God. Over this coming week we follow the theme “Growing together”. We aim to further explore reconciliation and collaborative leadership. We will also work together as a learning community to consider what IS, what COULD BE and what WILL BE in our regions, taking away ideas and inspiration that we pray will be transformational for us, our areas and our nations. So now I greet all the manuhiri, you who have come here from all over the world, investing time, energy and resources. I pray that, as we receive God’s blessing here, we may in turn be a blessing to our hosts and to our communities. For many years our strapline has been to be a voice for the voiceless. That is our calling, but more than this, we are also all called to loose the chains of injustice, to set the oppressed free, and to share our food with the hungry. Then, says God through the prophet Isaiah, our light will break forth like the dawn; our healing will quickly appear; and we will call and the Lord will answer. Thank you again to the home people who have come to offer a welcome but who will, I pray, leave fed by the spirit of Christ in this place. May I close by wishing upon you a traditional Gaelic blessing. We will be welcoming 100 delegates to our 6th Quadrennial conference in Lincoln New Zealand 15-21 April, exceeding our highest expectations. The event is now full! Do pray that the event will be transformational as we learn from and support each other, reflect prayerfully on our ministries, and receive resources we can adapt to our own context. We hope to be able to record key elements of the conference and make these available. If you do not receive our eNews do sign up now so you can share the conference with us. May you know the joy and peace of the risen Christ. Join us in New Zealand! We are very excited to announce our 6th quadrennial conference, in Lincoln, near Christchurch, New Zealand. There is an outline in the Conferences tab and the full programme under further details. We trust God that this event will not only be inspiring and encouraging but also transformational. We will model a ‘learning community’ approach and provide this and other materials to take home and adapt for your country. We are thrilled Dr Rosemary Dewerse will share her wisdom and experience in bringing communities together, a vital calling for many rural churches. And Jenny Dawson will pick up another common theme for rural churches across the world: shared ministry. New Zealand is at the cutting edge of new approaches to developing the ministry of the whole body of Christ and Jenny will be reflecting on the highs and lows. Plus an opportunity (if you wish) to contribute your inspiring case studies and share in leading worship in a way that reflects the riches of the culture of your region.